This entry was posted in FR and tagged nouvelles on January 23, 2016 by FEMEN. This entry was posted in FR and tagged nouvelles on January 22, 2016 by FEMEN. Pour adresser à Radio Intensité, un communiqué, un commentaire, une précision, ou une info, merci d'utiliser notre formulaire : ICI. Pour diffuser votre manifestation dans notre agenda, utilisez ce formulaire : ICI. 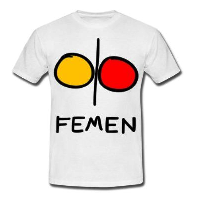 This entry was posted in EN and tagged news on January 22, 2016 by FEMEN. This entry was posted in DE and tagged nachrichten on January 18, 2016 by FEMEN. Limoges : Soirée autour du film "Je suis FEMEN"
This entry was posted in FR and tagged nouvelles on January 18, 2016 by FEMEN.